MILESTONE: Gina Rinehart has done what few people could ever have achieved. 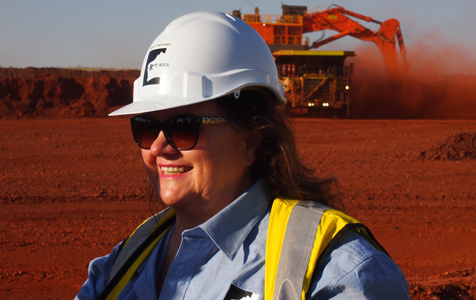 Gina Rinehart has shown the dogged determination of an entrepreneur to develop the Roy Hill iron ore project. According to ANZ's head of Australian economics - corporate and commercial, Justin Fabo, iron ore has been one of the weakest commodities this year, and likely to continue in this vein. "Key consumers - Chinese steel mills - still don't seem convinced higher prices are warranted, while high iron ore port stocks and rising seaborne supply remains on offer. It reached a new nadir last month after trading at just US$75 per tonne, marking a 42 per cent loss since the start of the year, although it quickly recovered. However this new low is not expected to be the bottom of the trough with data from Morningstar predicting an eventual slide below US$70 per tonne. New research from the analyst firm has forecast the metal to reach its lowest point in 2017, falling to US$70 per tonne before recovering to a more stable US$75 per tonne by 2020, due to Chinese iron ore miners slowing output and the righting of prices as more stock floods the market. But in the best news for the sector, the unpopular mining and carbon taxes were both repealed in 2014. The policies were ushered in by the Gillard government in 2012, and both left a bad taste in the mouth of industry. News that the carbon tax had been buried was positive news for the sector in an otherwise bleak year. "Repeal of the carbon tax is good news for the Queensland economy," QRC CEO Michael Roche said. "The carbon tax was a massive double-fail." The NSW Minerals Council added that the repeal will help to save resources jobs, congratulating the Government on the decision. There was also a collective sigh of relief when Tony Abbott came good on his election promise and buried the mining tax.